Alzheimer’s disease is a common form of dementia which destroys brain cells and tissue. As this degenerative disorder progresses, this damage spreads, causing confusion, memory loss, and diminished cognitive function. Alzheimer’s disease normally affects people over the age of 65, but there are some rare forms of Alzheimer’s disease, called early-onset Alzheimer’s disease, strikes people far younger. There are many different forms of Alzheimer’s disease, and its cause is unknown. However, a rare form of this disease, known as Dominantly Inherited Alzheimer’s disease (DIAD), is known to arise from a mutation in one or more of three genes: PSEN1, PSEN2, and APP. Individuals with DIAD usually begin to experience memory loss and other symptoms of dementia by the age of 40, and sometimes even as early as age 30. Recently, a team of researchers studied people with DIAD, since its early onset provides a longer time span in which to study the disease’s progression, and to analyze changes in the brain which take place before clear symptoms are recognized. The research team included professors from the Washington University School of Medicine in St. Louis, MO and the German Center for Neurodegenerative Diseases in Tubingen, Germany. The goal of their research was to see if a simple blood test could detect early signs of Alzheimer’s disease well before symptoms occurred. The results of their research were published in the journal Nature Medicine. Using previous research which showed that raised levels of the cerebral fluid neurofilament light chain protein (NFL), provided a strong indication of the presence of brain damage, the scientists’ goal was to find a simple and inexpensive blood test to detect raised levels of NFL. Currently, doctors test for increased levels of this fluid using a lumbar puncture (better known as a spinal tap), a procedure that is both painful and expensive. The researchers were optimistic that a blood test would be effective, since damaged and dying cells tend to leak NFL into an individual’s cerebrospinal fluid, after which it makes its way into the bloodstream. The team of scientists studied data from more than 400 people in the Dominantly Inherited Alzheimer’s Network (DIAN), an international network led by Washington University. All the participants attended the DIAN clinic, gave blood samples, completed a series of cognitive tests to assess memory and cognitive function, and received brain scans. These tests were repeated at various times throughout the study. An analysis of the initial blood samples of the participants revealed higher levels of NFL in those individuals with the DIAD gene mutation. Continued analysis of the participants’ blood samples demonstrated that levels of NFL continued to rise in those individuals with the DIAD gene mutation throughout the duration of the study. However, individuals who did not carry this gene mutation did not have elevated NFL levels, nor did their NFL levels rise over time. The research team eventually confirmed the striking result that NFL levels began to rise in individuals with the DIAD gene mutation 16 years before the onset of symptoms. Brain scans demonstrated a similar result: the rate NFL increase corresponded to the thinning and shrinkage of the brains precuneus, a region of the brain which plays a fundamental role in memory. Lewy body dementia and Huntington’s disease also cause cells to leak NFL into the bloodstream, implying that this blood test might also be effective for the early detection of these diseases. The researchers are now anxious to determine the best NFL biomarkers and the most significant rates of change, in order to best alert doctors of the potential hazards ahead. 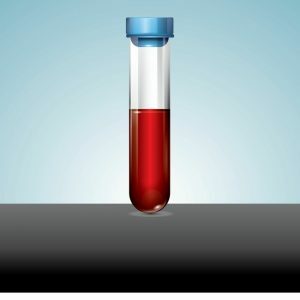 More importantly, the researchers hope that this new blood test, a breakthrough which can detect a form of Alzheimer’s disease nearly 20 years before the onset of symptoms, will lead to a blood test that is similarly effective for all forms of this disease. This is good news for all of us, since the sooner we become aware of a problem, the more likely doctors will be to provide a beneficial treatment for us. At Hamilton Grove Healthcare and Rehabilitation Center, in Hamilton, NJ, we are experts in handling all levels of cognitive impairment, from mild cognitive impairment to Alzheimer’s and other dementias. We have created a unique environment and care program specifically designed to address the needs of this population. Our Alzheimer’s Unit is situated in a separate, secure wing to ensure the safety and well-being of our residents. It offers a structured daily routine, mind-stimulating activities, excellent social interaction, with optimal patient independence in a calm and soothing atmosphere.